I didn’t need another Twitter app – really, I didn’t. I was perfectly happy with the standard/official Twitter app for the iPhone and iPad. But I started to use lists in Twitter more and more and the standard app is just terrible or lacking in this regard. I found another app – just to manage my lists – but it was clumsy and buggy. 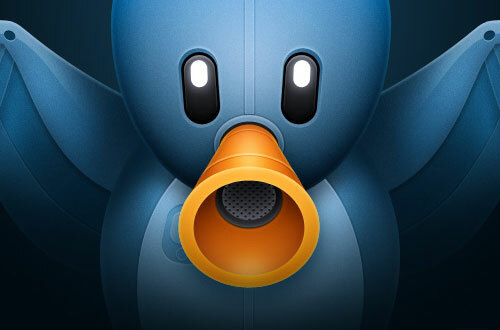 And then I found Tweetbot… wow. 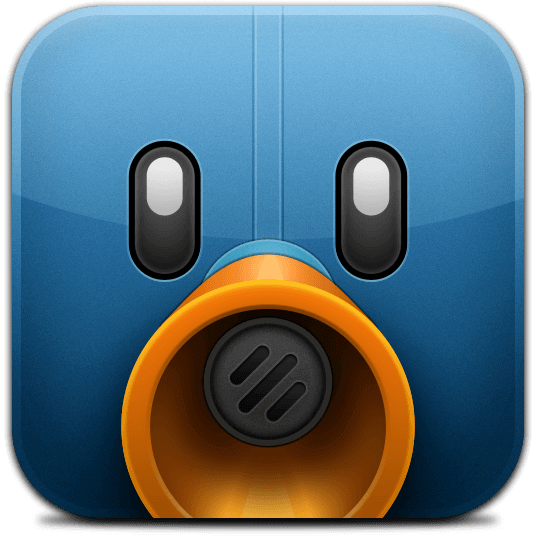 Not only is Tweetbot great for easily managing your lists (my original objective) it is without a doubt, the best iOS app for Twitter on the market – in every single way. The user interface is not only pretty – it is smart and intuitive. Not only are the features that you want and need there, there are features that you didn’t know you need and now couldn’t live without. It’s different than most in that it was designed to run as portrait and it doesn’t open loads of those swipe windows that can quickly get cluttered. The developers (tapbot) not only make good use of the screen for navigation and general layout, but they also make the most of gesture controls. As you can see, they are similar in functionality but the layout is optimised for each platform – i.e. the iPad version is not just a larger version of the iPhone version. 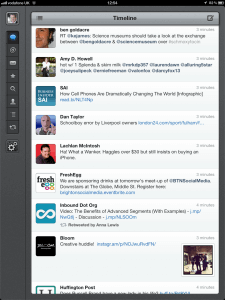 Navigation to your timeline, your mentions, etc are on the left on the iPad and on the bottom on the iPhone. The iPhone provides three standard buttons and then the second two can be configured by the user. Double tapping on the icon will take you to the top of the list/timeline following an update. Once you start following more than a couple of hundred people on Twitter, your timeline can become very cluttered. This is where using lists can really help. Tweetbot makes it really easy to utilise your lists with their “multiple timeline” feature – where you simple select between your main “firehose” timeline or any of your lists. 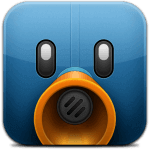 Switching between is a dream and it will totally change the way you use Twitter – permanently. 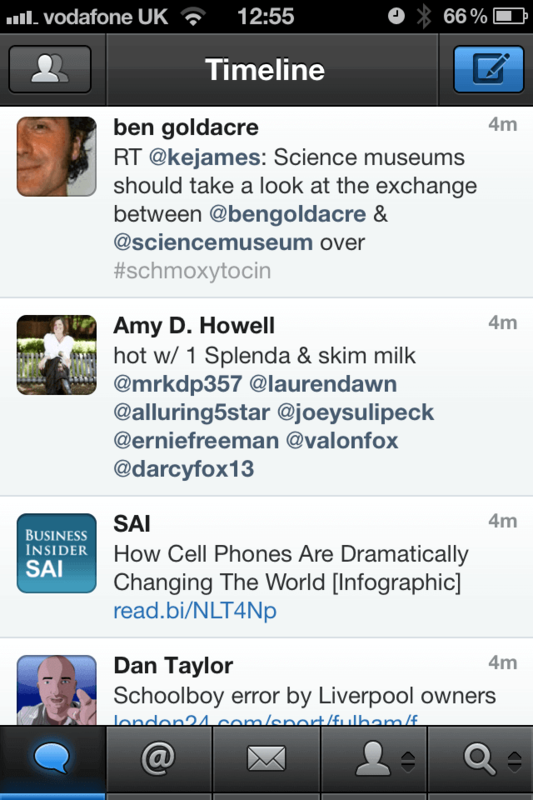 In addition to multiple timelines, Tweetbot offers a number of other ways that you can filter your feeds. You can search within your timeline(s) using the search box at the top of the list. As you type, your timeline will be dynamically reduced to reflect your search. This is great for finding a topic or comment that you perhaps may have missed. Additionally, you can mute people, tags or clients. Is there someone in your timeline that is just way too noisy today? Or do you never want to see Spotify or automated TweetFeed tweets in your feed? Then simply mute them – either for the day, week, month or forever. So awesome. Reading tweets has never been easier – especially with the multi-gesture support. You can tap on the tweet and you are provided with various options – to reply, retweet, favorite, share or other actions (includes view conversations, view retweets, etc). If you click a link the website shared is opened within Tweetbot – no need to go to Safari or another browser. Thumbnails of photos that are shared are automatically displayed – which is really helpful. 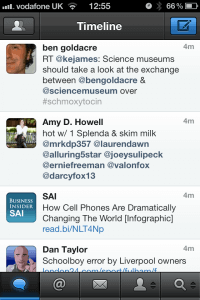 If you want to see the whole conversation that a single tweet is part of – you just simply swipe from left to right. You can even configure a triple tap to do what you wish – reply, retweet, favorite, etc. Getting your message out is just as easy and intuitive. You can upload photos and videos easily. You can tag your current location. When you start typing a hashtag Tweetbot automatically suggests ones that are currently already popular – this is really useful if you are referencing an event that has been abbreviated. There is also the same sort of autocomplete for people once you type in the “@” character. This was why I originally went looking for a new app and Tweetbot delivers this very well too. Whenever you follow someone, you can add them to a list then and there. You can also add people from your timeline into a list by tapping on their avatar and getting their profile. You can also look at your lists and add/remove people as part of an overall list management process. So here’s the deal – this is simply the “best iPad and iPhone app for Twitter” available and worth every penny of the $2.99 / £1.99 they charge. 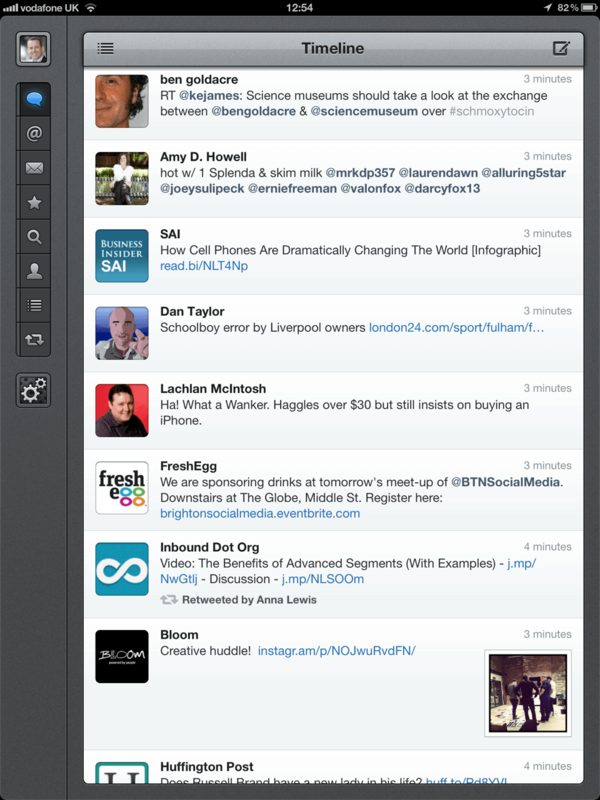 I have replaced my standard Twitter app, removed its notifications and moved completely to Tweetbot – it’s that good.